The Summer TV season has been incredibly strong this year with the sadly-just-canceled “Hannibal” and “Halt and Catch Fire” cementing their status as two of the best dramas on TV, and HBO getting people talking with the divisive season and series premieres of “True Detective,” “Ballers” and “The Brink.” While the networks struggle with misfires like “The Whispers,” “Aquarius” and “The Astronaut Wives Club,” in swoops USA and AMC with two of the most intriguing offerings of the season: “Mr. Robot,” a show about humans, and “Humans,” a show about robots. Both have incredibly high ceilings when it comes to dramatic potential, asking fascinating questions about man’s technical interconnectivity, emotional well-being and interdependence. And while both hinge on concepts that could make them difficult to maintain over the course of an entire season, they also have enough promise and creativity to hope that they remain as great as they are to start. Premiering Wednesday, June 24th, USA’s “Mr. Robot” might be the best show in the history of the network. (Sorry to fans of “Psych,” “Burn Notice,” “Suits” and “Monk”). It has that kind of potential. There’s a reason they took the premiere episode, which plays like a film, to the SXSW and Tribeca Film Festivals. It definitely has the best series premiere for the network that has struggled a bit to find a critical breakthrough in recent years. The first episode is riveting, driven by cinema-caliber direction from Niels Arden Oplev (“The Girl with the Dragon Tattoo”), a razor-sharp script from Sam Esmail (“Comet”) and a fantastic performance from Rami Malek (“The Master”). Malek has been an interesting supporting actor for years but this part fits him perfectly. The furtive eyes that have always conveyed hidden intelligence and emotional depth are put to use to capture one of the most instantly memorable characters in recent years. As a righteous hacker, a technological Robin Hood, Malek finds a balance of vulnerability and confidence that’s just right. Malek plays Elliot, a genius programmer who works for one of the biggest corporations in the world, a company he hates on every moral ground and that he secretly hopes he can destroy from within. He uses his hacking skills to secretly help those around him without them even knowing it—such as investigating the suspicious man now dating his shrink (Gloria Reuben). In the opening scene, he takes down a child pornographer, puts on his hoodie, and disappears back into the crowd. He doesn’t want attention. He can’t handle attention. It’s almost as if the light hurts him a bit, or brings to the surface the trauma from his abusive childhood, general social anxiety, or drug addiction. Elliot narrates what might be a majority of the two “Mr. Robot” episodes I’ve seen and while it can sometimes feel a bit overused here it allows Esmail and Malek to really define the character in a way that helps separate “Mr. Robot” from generic basic cable TV. Elliot’s life changes when he’s contacted by the leader of an underground hacker group (Christian Slater) known as Mr. Robot. Many people have railed against corporate America at one point or another but what if you were literally given the way to destroy it? Mr. Robot wants to take it ALL down. We’re talking about moves like eliminating all debt. Imagine if all credit card, mortgage, student loans, etc. just disappeared? How would the world change? And yet “Mr. Robot” is also about the difficulty of being in that in-between, stuck between two possibly evil entities—one corporate, one decidedly not. There’s an addictive energy to “Mr. Robot” over its first two episodes as it zips from boardroom to underground computer lab to Elliot’s apartment and so on and so on. The filmmaking here is so vibrant but Malek’s emotional honesty never allows style to overwhelm substance. What’s most remarkable is that “Mr. Robot” is so much more complex than it could have been in less-talented hands. It takes a relatively predictable concept like taking down evil corporations with modern technology and captures the moral and human complexity that would still be contained within such a world. People don’t always want Elliot to save them. Humans are more complex than a technological Robin Hood, or a company of them, can understand. And it’s that complexity that elevates “Mr. Robot” into must-watch TV. 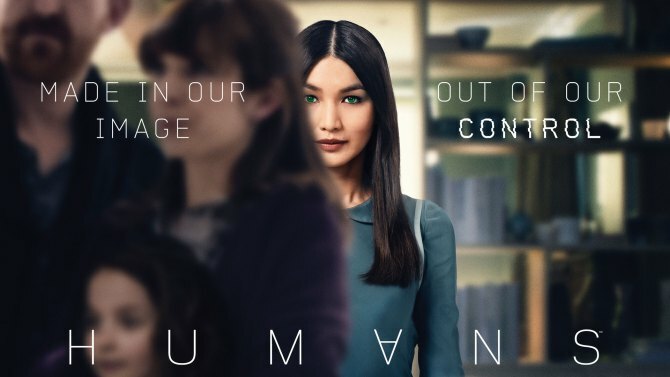 Slightly less instantly addictive but certainly worth watching is AMC’s “Humans,” a British import that is supposedly breaking viewing records over there and premieres here Sunday, June 28th. It’s easy to see why. With DNA that can be traced back to “Battlestar Galactica,” “A.I. : Artificial Intelligence” and even “The Twilight Zone,” “Humans” is asking timeless questions about what it means to be, well, human. From the opening scenes that feel like echoes of concepts played with by Robin Cook and Michael Crichton in the ‘70s and ‘80s, “Humans” intelligently adds to this decades-long conversation with strong writing, interesting performances, and, most of all, an eerie, disconcerting tone that forces us to question exactly what we want to happen. It’s unclear, especially at the beginning, who are the heroes and the villains of this piece, and I like that kind of moral ambiguity in my TV. It’s too rare. “Humans” is a multi-thread narrative that takes place in a not-too-distant future in which we can all purchase “synths” for our own personal use. Robot technology has reached a point where you can simply buy a programmable robot nanny/housekeeper who looks mostly human except for her perfect skin and green, hollow eyes. Of course, man finds other purposes for synths as well, including menial labor and sexual congress. What would we do with such technology? And what would its existence do to us? If we took out all menial labor in the world, would we use that time we now use to clean for creative ends? Would we become better mothers, fathers, husbands, or wives? Or would they simply make us feel inadequate by being better caretakers? The main narrative in “Humans” centers on a synth being purchased by an average family. Her name is Anita and the working matriarch of the family can’t stand her from the beginning, but her youngest daughter takes to her instantly, and her son certainly doesn’t mind the way she looks. But something is a bit off about Anita. She makes mistakes, which shouldn’t be possible. She initiates contact, which she should be programmed not to do. What’s going on with her? She’s somehow related to a group of synths who have escaped captivity and are clearly well beyond their programming. Are they the singularity—the event that essentially signals the end of humanity as we know it? And how will all of this tie back to the most tragic arc of the first two episodes of “Humans,” in which a man played perfectly by William Hurt is forced to deal with “retiring” a synth that he has had for years and clearly now sees as a son? Clearly, “Humans” is dense with ideas. It’s a smart show. The execution can be a bit predictable—shut off the techno score every once in a while, people—and it’s not as visually interesting as some of its sci-fi competition, but there’s so much going on here thematically that it’s always bouncing from one complex question to another. And that will keep me engaged all Summer.